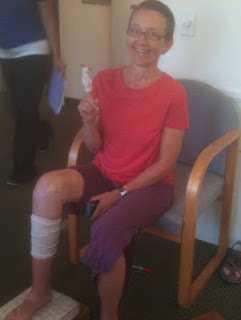 Here I am earlier today at physical therapy. Look closely. See the sweet alpaca finger puppet? I'm trying to instigate finger puppet day on Wednesdays in the clinic. So far it hasn't really taken off, I'm the only patient using a small woven toy to get through the sessions. But that's okay, it isn't easy to start a fad. And my cute little friend makes everyone smile. Look closely again. See my foot on the wooden blocks? Someone will slowly slide them back and make my knee bend. At first it's fine, then it gets painful, then it gets excruciating. Then I am not smiling at the puppet but squeezing him and chanting my favorite PT mantra "Ow, ow, ow, ow, ow". Aaaaah. Life in the rehab retreat is not easy. What you don't see in the photo are the three large screws that the surgeon removed on September 7th. Here they are - the lip balm shows you the size. I kept them and put them under my pillow hoping the Screw Fairies would come and leave me a present. No such luck. All I got were some painkillers, an ice pack, and five holes in my knee. Alas. Life in the rehab retreat is not easy. I spent a few weeks in a narcotic haze; my good spirits and emotional outlook got a little bleak. It seemed like I would be housebound forever and never learn to walk again. But I just kept practicing. And somehow these past few days, there was a sudden lightening of my mood, more space, more humor, more compassion for others. I might feel depressed and stagnant and stuck but I never lose faith in the teachings. When I suffer, when destructive emotions get the best of me, I know it is not a failing of the dharma, but of my ability to apply it. Dig deeper I tell myself. Rise above. Refocus. Breathe. Let go. Pray. I am so tired of being sick and tired. I want to leave the house by myself. I want to be out in the world on my own. Not yet says my karma. What to do? Dig deep. Rise above. Refocus. It is temporary. It is a wonderful opportunity to practice. It is a way to be more empathic. Turn your mind towards what is working, what is positive, and how you can help others. Sometimes I need to re-orient every day, every hour, or sometimes moment by moment. All in all my life isn't so bad when I focus on what Buddhists call the freedoms and riches. I remind myself how lucky I am to be alive. To have a mind that works. The only thing I need to accomplish my aim in life is a mind that works. Even if I never walk, if I limp, if I have chronic pain it doesn't matter. If my mind works then enlightenment is possible. Wow! How amazing is that? I think all of us can see that our problems aren't as bad as we think. This week my mind turns toward the Pakistani girl who was shot in the head. My heartmind is with her. I send my prayers over the ocean. I tell her "Come on, you can make it". I thank her for being brave and outspoken, for inspiring us to do better. And then I pray for the perpetrators, may they find compassion in their hearts. May they stop the violence. Her story has helped me gain perspective. It has opened my heart. For that I say thank you. And on a final note - get a finger puppet! I promise it will make you smile. Use it to refocus on what is good and right and positive in your life. Remember: what we focus on becomes our reality. Every moment we have the choice. Thank you for all your kindness and support. May you be healthy, happy, and at ease. So glad to see you on the road to recovery, Ani-la!